This an Everard's pub with an excellent restaurant which we have block booked for the evening (it's also good beer guide listed with four proper beers:-)). Apologies for those who would have preferred it in Loughborough but we have (again) been unable to find anywhere available that night. Cost is £20 per head for the three course meal. Menu's will follow, but at this stage we need an indication of definite numbers so we can confirm by 15th January. If you intend to join us please let me or Mike Lang know as soon as possible - payment is to be made on the night so we don't need any cash yet! Please pass this invitation on to those whose e-mail I don't have (or who won't see our January newlsetter). The invite is open to all RVP members and shareholders plus those who've assisted us in the past year. As ever, for those further flung, the date coincides with the GCR winter gala and we will need TPO crews and people to staff Rothley shed. If you are able to help us out over the weekend please do come to the meal as well - if you need accomodation let me know. MERRY CHRISTMAS & HAPPY NEW YEAR - to all of our members / shareholders / supporters and readers. Many thanks for your help in making the past year a very good one for RVP - hope to see you all in the New Year. CHRIS PRIOR - It is with sadness that we have to report the premature death of Chris, who passed away last night after a illness with lung problems. Chris was our TPO manager for several years in the 1990's - a larger than life character with a style that made our TPO operations on the Great Central highly entertaining for all involved! His working life was with the Royal Mail, originally at Peterborough station, but becoming their manager at Stanstead Airport prior to his early retirement. This background benefitted RVP considerably behind the scenes with comprehensive reviews of our TPO working procedures and risk assessments (which greatly assisted in getting the speed limit for TPOs on the GCR raised above the usual 25mph limit). In addition Chris also gave practical help on the initial restoration of 80301 in 1997/8. Chris resigned from RVP a few years back after changes in his personal life (and increasing comittment to the Royal Mail) made it difficult for him to get to the railway - but he continued to take an interest and (had severe illness not intervened) was intending to return. Our sympathy to Chris' family at this difficult time. After a long wait the three new additions to our Mark 1 TPO set are now on the move. The first, brake tender 80458, arrived at Quorn today (with 80301 in the background). The other two (Sorter 80349 and tender 80433) will follow shortly. This makes our Mark 1 TPO set four vehicles, covering all four vehicle types. Restoration work will take place as soon as possible, with vacuum baking a priority (together with air brakes for 80301, to make the whole set dual braked). A repaint will follow in due course and the whole train will no doubt appear at a gala event in the not too distant future. The acquisition of these vehicles has been funded and co-ordinated by our "1V86 Mark 1 TPO fund"; the fund remains open to pay for the restoration work. 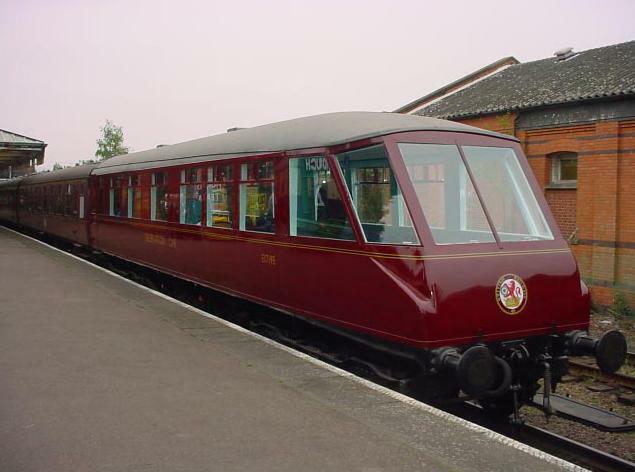 Donations should made payable to RVP ltd, with Mark 1 TPO written on the back - all funds raised for this appeal go directly to the restoration and maintenance of these vehicles thus helping us to guarentee the continued operation of mail exchangeson the GCR. The address for donations is 26 Cliff Park Avenue, Wakefield, WF1 2DW. Our thanks to EWS for storing these vehicles for the past year, and to the GCR for making the space to allow them onto the railway. AWARD WINNERS AGAIN! 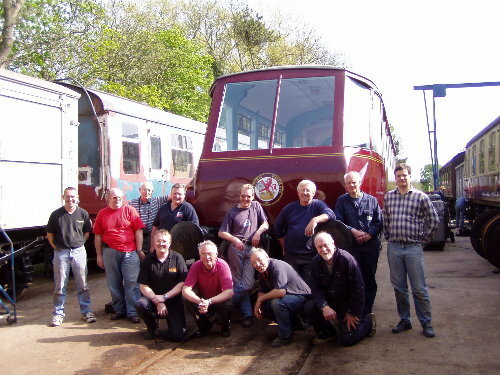 - It is very pleasing to report that RVP Ltd have won the Heritage Railway Association 2007 "Small Group" award for the restoration of BEAVERTAIL car 1719E. The judges were impressed by the excellent standard of restoration achieved. The recognition this award gives is greatly appreciated - it is a considerable morale booster to the volunteers who freely give so much time (often in less than ideal conditions and with little or no immediate reward). 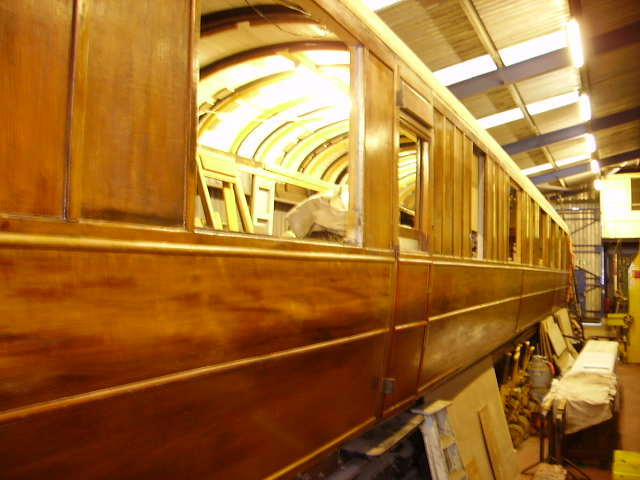 Although much of the work on this particular vehicle was completed by contract labour the detailed interior restoration was carried out by volunteers - who were absolutely determined to replicate the original interior as closely as possible. This proved to be a frustrating task with little information to work from and few remaining original fittings. The end result is magnificent and we are glad this has now been recognised through this award. This is our second national award, the first being for 6 wheeled brake van 70654E from the Transport Trust. GCR Gala - As those who attended the GCR over the weekend just passed will know, the GCR put on a show which would be very hard to beat. Six locos in steam with a very frequent service on the double track. For our part six TPO runs were made over the weekend using 80301, Rothley shed was open with the LNER TPO on display and the Beavertail was in use. RVP would like to thank all who were present over the weekend. Aside from the (usual) very good reception for the mail exchanges, the TPOs at Rothley attracted another large stream of visitors, as did the sales stand and shed. Alan had no shortage of company acting as steward in the Beavertail (full and standing on most trips), and we also had some volunteers doing real work rather than train riding! We had a total of 22 volunteers working at the railway this weekend - certainly a record for the recent past. Financially the large increase in donation rate we have seen at GCR events this year was sustained - and this goes some considerable way to making sure we are able to continue to add to the overall GCR scene. To finish the weekend we accompanied the Chairman of Leciestershire Council and other invited guests on a tour of the railway (and specifically our projects) Sunday afternoon. The general impression the railway gave was excellent - the mail exchange was superb, the information and discussion they got from those at Rothley about the buffet car and TPOs fascinated them, and the final ride back in the Beavertail in beautiful sunshine finished it off nicely. They were extremely complimentary about their visit and asked that thanks be passed to all involved - there is no doubt the impression given will assist us greatly in future local grant applications and, I'm sure, will help the wider GCR build its relationship with the local councils. Last week was work week. The intention had been to re-roof short brake 62565, however the position of the vehicle made this difficult so instead the interior was cleared out (no small task as it was crammed roof high with a set of seats) and the battery box metal work installed. However main focus of activity was buffet car 24278 which had new teak panels laid out for measuring and cutting. These were then fitted. There is still much more to do, but the sight of new panels going on after so long is a great motivator! At the end of the week 80301 also saw some work as did the ground net at Quorn (pictures to follow hopefully). Many thanks to all involved - the week has knocked several jobs off quicker than would otherwise have been the case. AUTUMN GALA TPO TRAINS - This years GCR winter gala is on Sat/sun 13/4th October. It features two TPO runs each day (using 80301), plus an additonal "Night Mail" on Saturday evening. There is also a mail train on the Friday night to open the event. In additon the BEAVERTAIL car will be is use and open to the public, the LNER TPO set will be open for visitors at Rothley and the shed will also be open. 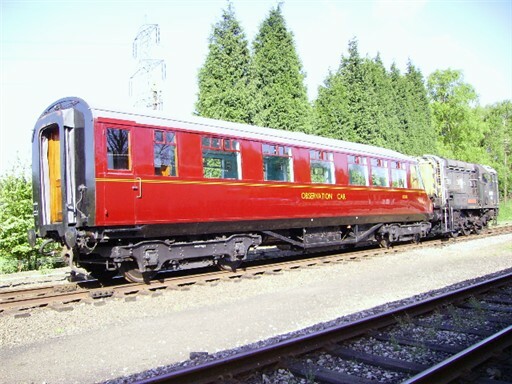 The GCR are also bringing in two visiting locos - full details can be found at www.gcrailway.co.uk. Leicester Museums Forum, with support from the County Council, have arranged a display of professionally produced banners at Snibston Discovery Park. The banners detail each of the forum member museums of which RVP is one. As can be seen the banners are to a high standard and will be donated to us for future use after the display ends in October. This is very welcome free publicity for us. WORK WEEK 2007 - the work week makes a return this year running from Monday 24th SEPTEMBER to Saturday 29th SEPTEMBER at Rothley shed. This years aim is to strip, repair and recover the roof of Gresley Brake Third 62565E. This vehicle was a forgotten member of our collection until Tim Pryce took it on as a personal project a couple of years ago. He has achieved much on the underframe and (after a break working on Mark 1 TPOs) is now looking to move on to the bodywork. Before he can do so the roof needs to be watertight and the workweek should achieve that key stage in its restoration. With this done the restoration to full varnished teak condition can continue as a background project - but the vehicles future will be assured with a watertight roof. If you fancy spending a few days in the Leicestershire countryside doing something completely different then please contact Tim (timpedigree@aol.com). DOROTHY (DOLLY) MASLIN - it is with sadness we have to report the passing away of Dolly, mother of Gordon (RVP's founder and current Trustee). 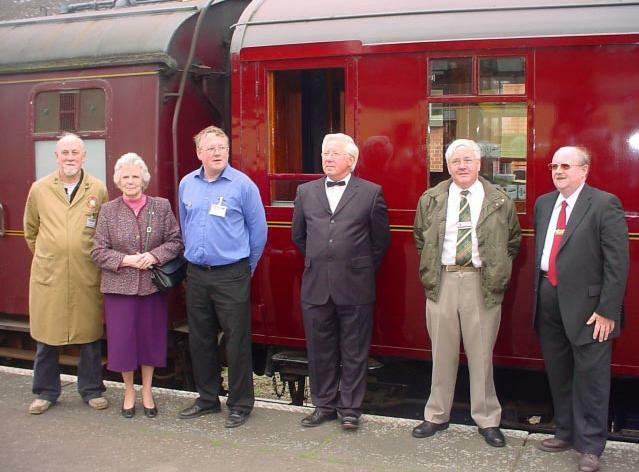 Along with her late husband (Edward) she was heavily involved in RVP's work not just through their son, but also active volunteers in the past and the owners of the fully restored teak pigeon van 4050 (which has operated on the GCR for the last 8 years). In more recent times many of us working at Rothley will remember the huge tub of sweets that used to appear periodically - sent by Dolly as a token of thanks for the work carried out by our volunteers. Our sympathies to the Maslin family at this difficult time. The total profit exceeded £2700 - an excellent result and many thanks to all who supported it. The money has already been spent on various items to allow the restoration of 24278 to continue - a roof canvas, window glass and heater grills have all now been ordered. Hopefully this will produce a very visible outcome from the raffle for the end of the year. AWARD WINNERS (again!) - It is very pleasing to report that RVP have again won an award in this year's "Leicestershire Heritage Awards" - The restoration of Beavertail car 1719E won the "Best Special Project" category at the ceremony last night. This year the categories had been altered to encourage a greater number of entries - despite this we were successful against competition from five other equally worthy local musuems. This is a magnificent result and reflects the massive amount of work which has gone into this vehicle over the past four years - both in terms of the fund raising effort, the contract work, and the final volunteer effort with the interior. As many of you have seen the end result is superb, and ,compared to many other carriage restorations, represents very good value for money. 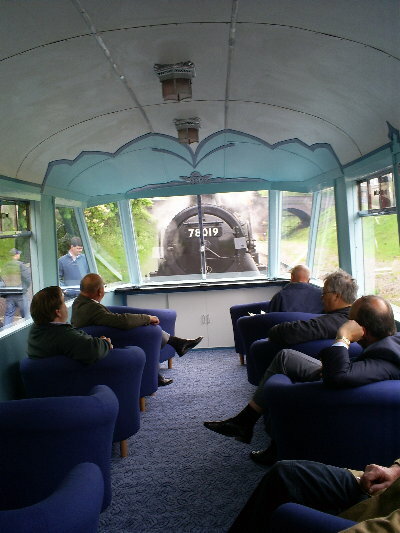 Of course we must also acknowledge the assistance of the GCR in providing facilities and a wonderful setting in which it can now operate. It is remarkable that the vehicle went on to win despite the judges not being able to view it on the inspection day because of a delayed arrival and the operational needs of the GCR. Instead they were taken through the restoration file, which obviously did a very good job of explaining the work done. This award reflects very well on RVP and those involved in the restoration - it should also bring a local publicity boost to the GCR and hopefully a stream of people to ride in the end product. Congratulations to all involved in its restoration - and for those who haven't seen it already 1719E will be operating on the GCR this weekend and at regular intervals over the year (please contact the GCR on 01509 230726 to check its operating dates if you intend to specifically visit it). In preperation for next weekends Mail by Rail gala 80301's new net frame as now been roped up ready for use. Subject to final checks the new net will see its first use next Saturday morning - and then seven more times throughout the weekend. The LNER TPO set will be on display at Rothley and the shed will also be open to visitors. NEWS UPDATE - 80301 TO PICK UP MAIL BAGS AT JULY GALA! - The team working on the new exchange equipment for 80301 are now confident that the brand new catching net will be ready for the JULY 28/9th MAIL BY RAIL gala. 80301 should therefore be collecting and dropping bags at speed for the first time since 1971. The rapid progress has been made possible by the small team managing this project ensuring parts were made and available at the critical times. The timescale is tight, but barring any unforseen problems it will make the gala deadline. Also running in the gala should be the BEAVERTAIL, BZ 70654 and Pigeon van 4050. The LNER TPO vehicles (70294 and 70268) will be moving to Rothley next week and will be open (along with the shed itself) for visitors throughout the gala. We'll have a display and sales stand at Rothley, with full updates on all of our projects. OTHER NEWS - our intended shed site (Nunckley Hill project) should be visited by the planning appeal inspector this week - and a decision should be with us in five weeks time (fingers crossed:-)). WORK WEEK 2007 - will be from 22nd September. More details to follow but if fancy a few days doing something to really help us move one of our projects forward please consider coming to Rothley. Work on the fitting of a brand new catching net to Post Office Sorter 80301 continues. Rapid progress has been made in the recent past, this photo shows the new net frame from the outside. The new lever in position on the inside. Finally the external lights fitted in the bodyside for night time mail exchanging. The work is far from complete, but is progressing very well and a completion date should be predicted shortly. UPDATE - the dining train referred to below is now full. 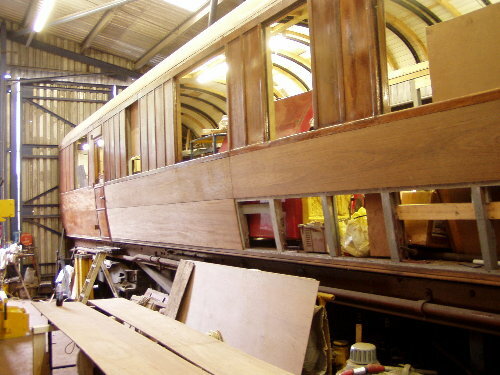 On the work front the volunteer teams have now resumed work on the complete rebuild of teak buffet car 24278. Current work centres around making the roof fit to receive a new canvas, tidying of the interior to create workspace, and fitting of corridor connections. Hopefully with a more concerted effort we can start to produce a visible result - and a second teak coach to match pigeon van 4050. 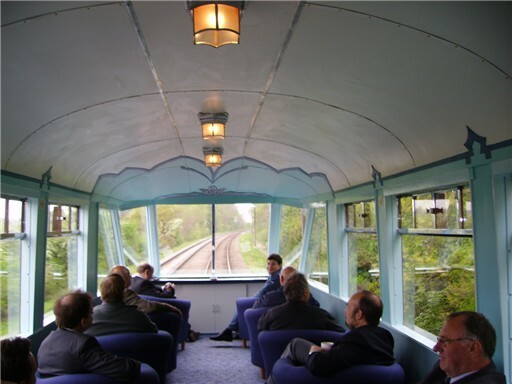 GCR DINING TRAIN BOOKING - the working members have a group dining train booking arranged for Saturday evening 16th June. Please e-mail Darren immediately if you would like to join us for this (spaces are limited and allocated on a first come first served basis). The culmination of the four year BEAVERTAIL project, and the completion of the initial aim - 1719E returned to full service on the 10:15 Loughbrough to Leicester North service. A short speech and door opening ceremony at Loughborough (L to R - Nev Goodman, Dorothy Green, Darren Martin, Mike Lang, Gordon Maslin and Alan Voase). This was followed by the trip to Leicester behind 78019 - 1719E on the rear of the train. This is the kind of view of the double track GCR passengers can now enjoy - the view through the saloon and out of the end windows as the train rounds Kinchley Lane curve. 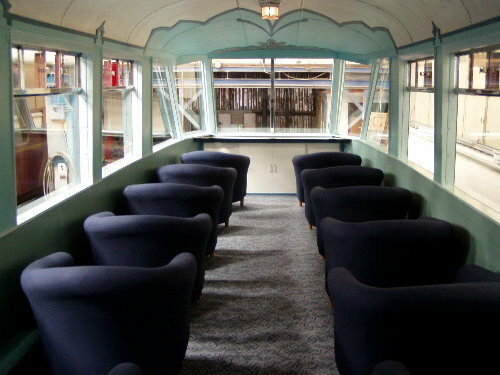 At the other end of the coach the seats laid out more in a lounge style. Finally, when the loco runs round at Leicester this is the scene, with passengers able to get a close up of the action. RVP would like to thank all who supported this project - and would also like to thank the GCR staff who provided refreshments on the launch trips. Please help support the GCR by making use of the vehicle - it is well worth the supplementary fare. While the Beavertail project is this weeks star attraction our other projects have not stopped. 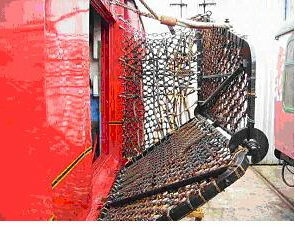 The mark 1 TPO team have been very busy making a new catching net for 80301. This has been done away from the railway, but last Saturday it was brought to Rothley for trial assembly on the coach for the first time. It was long day for the four man team, but by 18:30 the net frame was on as the photo shows. This is another key milestone in the project, but there is still much to do to fit the lever and operating mechanism to make it all work. So far the work on 80301 (including the body repairs necessary to refit the net) has cost over £2000. With the imminent arrival of the other three vehicles from EWS we urgnetly need more donations to enable the project to continue unimpeded. Donations to the usual address (see contacts page). Two TPO dates for your diary - JUNE 22/3rd we will be at the Nene Valley TPO gala with our sales stand. Volunteers are needed to man this - please contact Tim Pryce (Timpedigree@aol.com)if you are able to help out and wish to stay over in Peterborough. Secondly JULY 28/9th is the GCR Mail By Rail gala at which at least one of our TPO vehicles will be in action. The Beavertail left Rothley this morning for Loughborough ready for its saturday debut. This picture shows it leaving. This picture shows the interior looking back to the entrance vestibule. This picture shows it at Loughborough with members of the Monday team who were very heavily involved in the interior restiration, and who weren't in Saturdays photo. 28th APRIL 2007 - BEAVERTAIL READY TO GO! The final preperations are now complete for the launch of 1719E into service next Saturday. The GCR staff have now completed their inspection of it and have passed it fit for service. Meanwhile our volunteers have now completed the interior restoration with final painting and setting out of the seats. 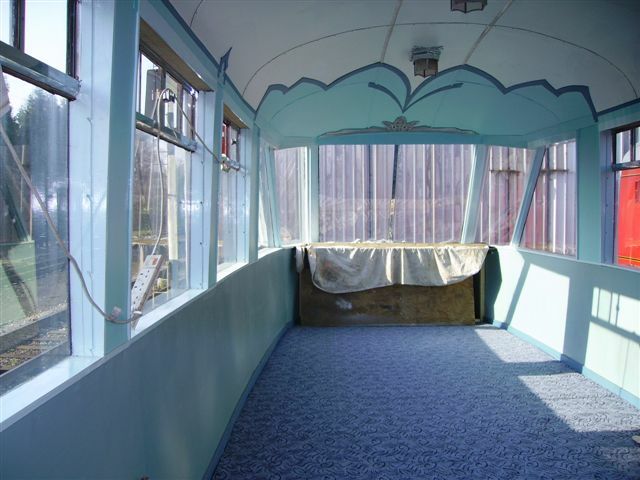 For the first time the completed interior can now be seen - pictures HERE, showing what will become one of the most popular places to sit on a steam railway! 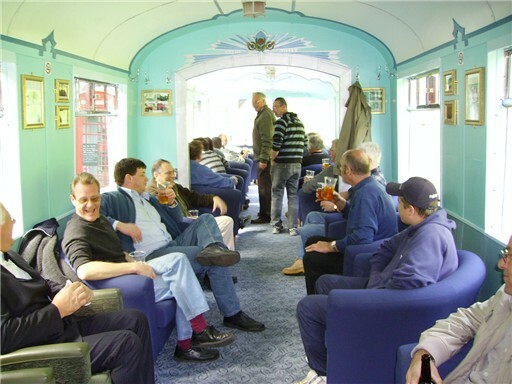 This view shows the whole of the saloon. 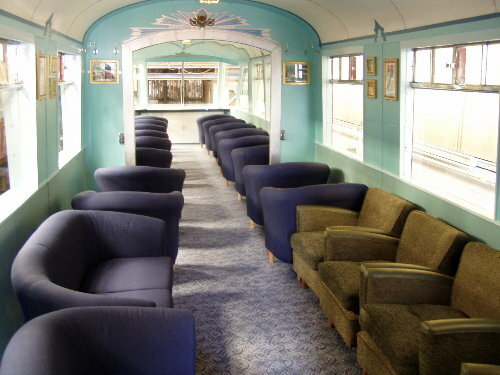 As can be seen it has a total of 24 seats; 16 tub arm chairs, 2 two seater settees and four of the original seats restored to their original condition (the green ones in the picture). 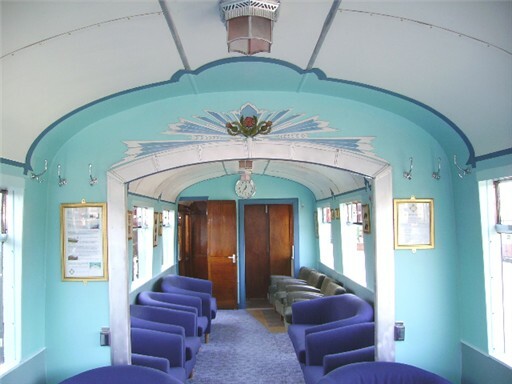 All seating is loose and can be arranged according to the vehicles use; but generally twelve single seats are in the main part of the saloon looking out of the end windows, while the rest are at the inner end of the coach arranged for meeting use. The end result of the interior restoration is superb - a real credit to all who have worked on it and really gone to town to give it as near as possible its original appearance. Finally a photo for the dartboard! 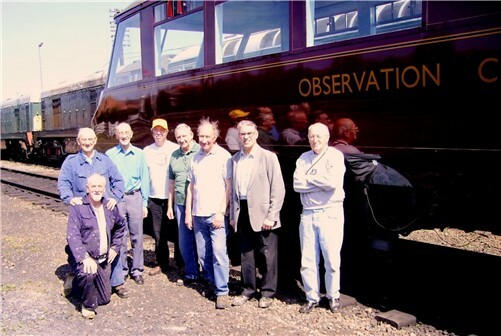 - those members of the restoration team that happened to be present (plus a couple of Mark 1 TPO interlopers!) line up in front of 1719. There are, of course, many people involved who aren't in the photo. Many thanks to you all. BEAVERTAIL LAUNCH - After a little scare when the seat supplier indicated they couldn't deliver the seats (happily now resolved) the launch date is now set for Saturday 5th May. Its first public passenger use will be on the 10:15 from Loughborough (for invited guests), followed by a round trip at 12:15 (for invited members of the restoration team). In the afternoon it will be used for a private charter. Full entry into normal passenger service will be from Sunday 6th May, when the GCR will run it on the rear of the RB set and charge a supplement for its use. It will also be available for charter use from that date. The GCR will have details of supplements and charter availability in due course (and all enquiries regarding its use should be directed to them). If you were a major donor to the scheme, or a member of the restoration team, you should have received an invite through the post for the first two trains - if you have not and believe you have been overlooked please contact us by e-mail. Those who participated in our "Buy a Seat" appeal last October should have recieved a letter from the GCR by now detailing their entitlement to use their seat - clearly you are welcome to use your seats from the 6th May. The Mark 1 TPO project continues to make good progress. 80301 is currently at Rothley haveing a program of work undertaken to make it ready to receive the new net assembly (which is being manufactured off site). The work includes re-opening the net door for the first time since the 1970s. To make the door operational has required new steel to be installed. In addition the body framing is being strengthened to take the impact from the catching of mail bags (quite intense as anyone who has seen a mail exchange will know!). The aim is to have the work sufficiently advanced to allow 80301 to be available for a gala at the end of July. This may be to drop bags only (as last year) but a trial fitting of the new net in May will allow a decision to be made on whether this too can be completed in the same timescale. The work on 80301 is being funded by our "1V86 Mark 1 TPO fund", which has now raised nearly £6000. 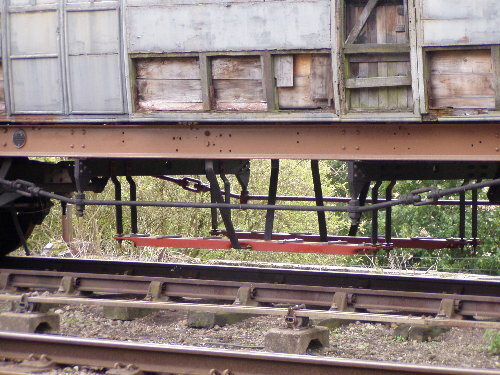 This has enabled not only the new exchange equipment to be made and fitted, but the purchase of another sorter carriage (80349). To this can be added the two other vehicles purchased by members to add to the train (80433 and 80458). All three of the new vehicles are kindly being stored by EWS at Wembley, but we hope to move them to the GCR in the summer. These will then need repainteing and fitting of vacuum brake equipment (80301 woill also have air brake equipment fitted to make all four dual braked). All parts for this work are in place, as is a willing workforce to see the project through. All we need is a continuing flow of funds!! Please consider supporting this appeal to ensure the creation of a new mail train for the GCR - donations payable to RVP Ltd (write 1V86 on rear of cheque) and sent to the address on the contacts page. Also at Rothley, BEAVERTAIL 1719E nears completion. The carpet was cut for fitting last weekend giving a very good idea of the final appearance. Chairs are expected this week and launch details to follow shortly. Update added to the Beavertail page. Very shortly we expect to be able to announce the launch date for the Beavertail - WATCH THIS SPACE! UPDATE - The Nunckley Hill planning appeal has now been validated by the Planning Inspectorate and the timetable set. A decision is due around June, following the submission of the written evidence by both sides. Clearly in the meantime we can do little on the site, but we are continuing to source materials to progress the project. 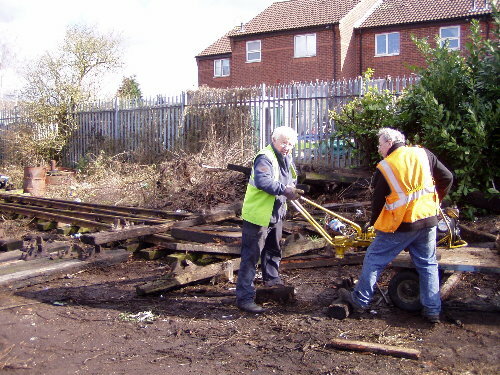 Work has continued recovering the track materials kindly donated by Snibston Discovery Park in Coalville. 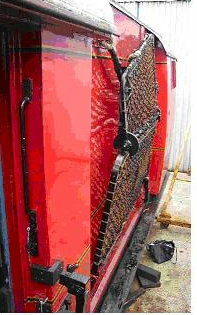 A large qauntity of rails has already been delivered to the GCR and we are now dismantling rail chairs for re-use on our branch. Meanwhile at Rothley work continues on the Beavertail, now moving into the final stage with the fitting of the original decorations. Four of the original seats have been re-covered and are now at Rothley, with the new seats ordered and expected to arrive shortly. NUNCKLEY HILL PROJECT - PLANNING APPEAL - Our appeal against the refusal of planning permission for our project has nowbeen lodged with the planning inspectorate. We have requested that the appeal is conducted by the written procedure - therefore further exchanges of correspondance will take place as we seek to provide evidence for our stance, followed by a site visit. The outcome should be with us in around three months time. Until this stage is reached we can clearly make no further decisions on the site, but we are continuing to collect materials for the laying of the connection with the GCR up to the site boundary. NUNCKLEY HILL PLANNING DECISION - Our revised planning application for the branch line and shed has been refused. This is clearly a major disapointment and something of a surprise. The reasons given relate primarily to ecological issues, which we believe we fully addressed in having a second ecological survey completed and the plans modified accordingly. For this reason we are now considering an appeal and will update progress here in due course. Needless to say the ongoing delay is frustrating - the formation was (after all) only ever built to be a railway!On the more positive side we have been donated a quantity of rail by Snibston discovery park. This includes plain rails, and several points. We intend to use this to get the point fitted on the GCR side of the fence and begin laying track towards the site boundary. Once we reach the site boundary we will re-assess the planning situation and go forward accordingly. The project remains very much alive! Last weekends Rothley shed opening, as part of the GCR winter gala, was hugely succesful. The TPO vehicles and Beavertail were all open and staffed, as was the sales stand. Several thousand people came round over the weekend and this was well reflected in the collecting tin. Many thanks to our volunteers who manned the vehicles for long periods with no breaks in the flow of visitors and wider thanks to the GCR for making the arrangements to get the vehicles into position. It was superb to see the GCR so busy and to see the interest our small collection can generate amongst the general public (now please all write and tell the planners!). 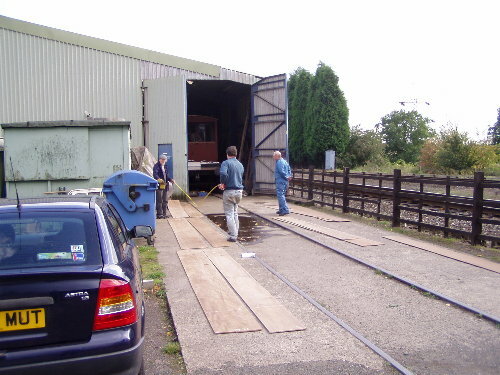 ROTHLEY SHED and TPO VEHICLES / BEAVERTAIL open for visitors this weekend (27/8th). The carriage shed will be open throughout the gala weekend. Our TPO vehicles and postal museum will be on display and open to visitors. 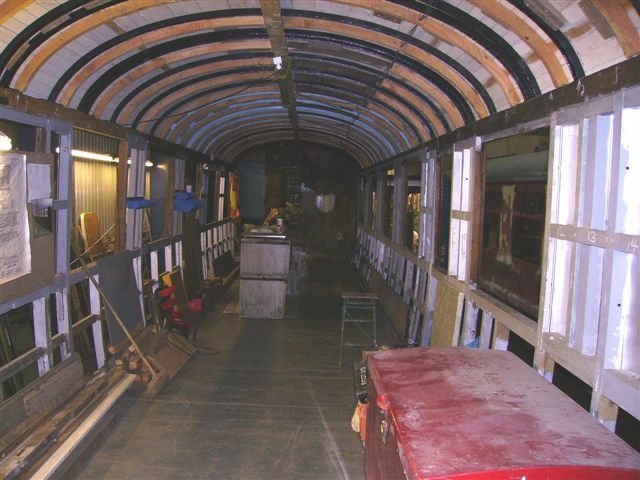 The BEAVERTAIL will also be open to visitors, with its interior now nearing completion (see update on Beavertail page. If you find yourself at Rothley do come and see us. Our annual meal is on the Saturday night (details below) - start time 7:30. Unfortunately, for reasons beyond their control, the Black Swan have had to cancel our booking. The Annual meal goes ahead however, but now at THE CURZON ARMS, MAPPLEWELL RD, WOODHOUSE EAVES. This is in the village centre a coupe of miles from Quorn station, and still reachable (both ways) by bus from Loughborough. If you are not sure of the location please use Streetmap and enter the postcode of LE12 8QZ. The menu will be available by Saturday. One consequence of the change of venue is that we now have a definite upper limit on the numbers than can attend - currently I have four spaces left, please e-mail immediately if you intend to join us. Apologies for the confusion and changes of location - there really does seem to be a problem in the Loughbrough area these days in getting places to take bookings for large parties. RVP ANNUAL MEAL - This will be held at the Black Swan, Loughborough Road, Shepshed at 19:30 on Saturday 27th January. If you wish to attend please e-mail me (above) - advance booking only as we need to confirm numbers. A menu will be available shortly - pay on the night. The Black Swan is in the centre of Shepshed (leave M1 at Jn 23, take A512 towards Ashby, turn right at first set of lights and follow road into village centre). Bus service is available to and from Loughborough. Apologies for the late notice (and change of venue) this year. We were unable to use our intended location as they were unwilling to take a reservation and expected us to turn up without one! MARK 1 TPO FLEET ON THE MOVE! - our newly acquired TPO vehicles are on the move. 80349, the post office sorter purchased following the successful launch of the Mark 1 TPO project, and 80438 (a tender vehicle being acquired by a member) have moved from Euston to Wembley. Here EWS have kindly agreed to store them until the GCR can accept them (later in the year once additional siding space has been created). In due course they are expected to move to the GCR, have vacuum brakes fitted and be repainted, to run as part of a four coach Mark 1 TPO train (with 80301 - already on the GCR, and 80458 - on loan to us, but still at Euston at present). The Mark 1 TPO appeal remains open and we urgently need more funds to cover the work reauired to restore these vehicles to use on the GCR. Please use the general donation form on the "wants" page . The appeal has successfully saved these vehicles for preservation - the speed with which they are returned to service is dependent only on the rate of donation! NEW YEAR, NEW DIRECTOR - Nev Goodman has been co-opted to the RVP board. As many of you will know Nev has been active for some years with both our Monday and Saturday groups of volunteers. Since the passing of Brian Green, Nev stepped up to co-ordinate the Monday team with impressive results. We have been seeking to recruit new board members to ensure those working at Rothley are properly represented and Nev's offer has been gratefully accepted. Nev's career was in the Royal Mail, and he therefore has a bias towards the postal side of our activities (and particularly the museum items). He's also active within the wider Leicester community and we are confident Nev can continue to develop our links with the local museums service.